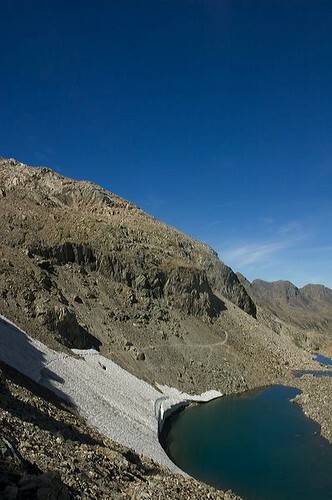 I keep being asked what I think would be the best route along the HRP for a first walking holiday in the Pyrenees. In the Pyrenean section of this website you can find reports of various trips but I’ve always avoided recommending one route. I now think that a slavish following of the HRP just misses out too much stuff that is good. If you are following the whole route in one go then obviously that is your aim. But it you are in the area for two or three weeks there are lots of side trips and other options to take. Routes often get changed. weather can delay you for several days at a time and the blistering heat can make you take detours and unscheduled rest days. It is always best to take as much time as you can and then follow your instincts. However, to avoid endless repetition of emails, this is the route I would choose if I was going back! This would form the basis of a great two or (even better) three week break. The walk can be started at Lescun, Candanchu or Cauterets. Give yourself as much time as you possibly can! You can find out more about these routes by looking at my previous posts. One of the most beautiful places in the Pyrenees. Lescun sits in its own hidden plateau and has one of my favourite campsites anywhere. From Lescun you can hit the HRP and on to your first refuge before walking through woodland to reach the Spanish border at Candanchu. Alternatively, and my preferred route, is to take the GR10 to Borce and then walking on from there. Whether you go via Candanchu or Borse the next step is to make your way to the Refuge at D’Ayous. D’Ayous sits on the GR10 and is a busy place but you can camp around the lake under the shadow of the Pic du Midi d’Ossau. Approaching from the HRP there is great wild camping before you get to the refuge. Next, it would the climb up to the Refuge at Pombie which sits underneath the Pic. Pombie is a real, high, refuge. you’ll meet nice people here and you can socialise if you want or camp well out of the way! From Pombie walk on to Arrémoulit one of the great high refuges. Pitches are at a premium here but search out both the land at the front and the back of the refuge and you’ll be OK. The Guardian here is a great character and given half a chance will show you his slide shows of mountain adventures all over the world. From Arrémoulit you have choices. My preference would be to cross over the col and descend into Spain. This is hard walking but the landscape on the high Spanish side is worth it, more rugged and barren than on the French side. You drop down to the Refugio on the Respomunso dam and lake. This is a characterful place and a good place for a beer. But walk on to wonderful wildcamp sites beyond the abandoned dam project. Then cross back into France over the Col du Fache, a great and dramatic day’s walking approaching the col over a precarious (but safe) patch of clingy snow! Head on down through the forests to the famous refuge at Wallon. There’s plenty of lovely camping here both near to and away from the refuge. By now you may well need to stock up on supplies. Drop down to Cauterets and even take a rest day. 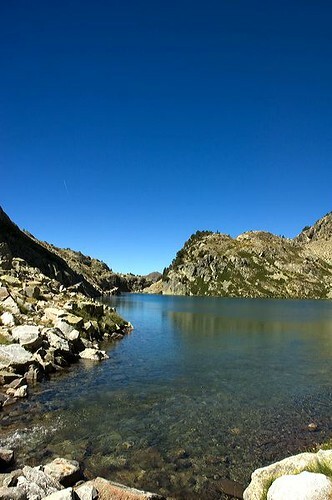 From Cauterets you can climb up to the HRP/GR10 variante that goes to the Oulettes des Gaube refuge and camping ground — a dramatic but cold location. From here you climb to Baysellance and then down to Gavarnie. But I would not go this way. I’d climb back up to Wallon (or go from there) up and over the crest of the mountains and down into Spain and the Rio Ara. This is gorgeous country.Don’t try and go too far, treat yourself to a wildcamp on the high grassy pastures. Descend to the high Refugio at Bujareulo. 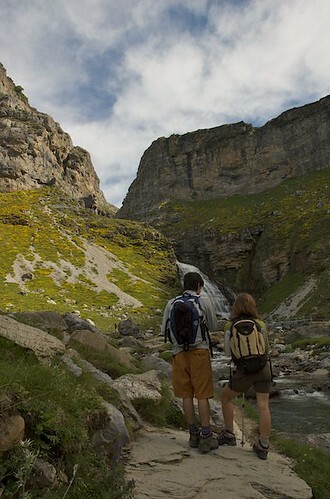 From here it is easy to access the wonderful Ordesa canyon. 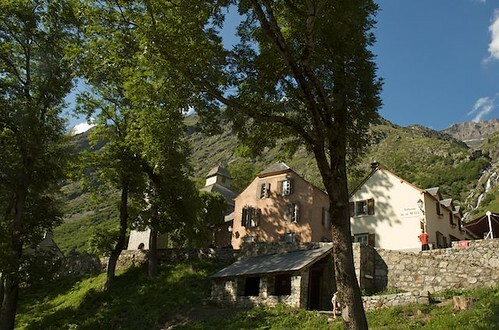 But a better trip is to descend to the lovely village of Torla and take a bus trip up to the Ordesa which will allow you a circular day’s walk around the whole canyon before spending an evening in Torla. 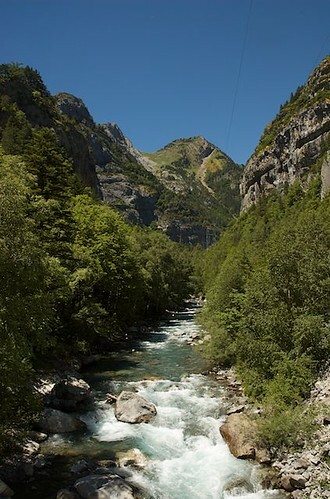 Then cross back into France via the Ordesa and Goritz and over the Breche du Roland, or even retracing your steps to Bujareulo and taking the old trade route back into Gavarnie. These routes from Spain allow you to see the Cirque at close quarters and give you the very best of views. You can take a day in Gavarnie and stroll up to the Cirque without your load. You can finish here but I prefer to walk on to the tiny Hamlet of Héas. The walk over to the Estaubé valley is a lovely day out and Héas a great place to spend the evening. From Héas it is an easy walk down to Gedre and a walk or bus to Luz. This total route will take about 14 – 15 days with rest days. It is worth taking the extra time to enjoy it. But shorter trips will be just as exciting and will probably encourage you to take a longer trip next time! That’s a lovely area, Andy, sadly only once visited by me since Sue and I did a full HRP route in 2004. It’s perhaps worth noting that in his superb guide book, Georges Véron describes “a complete traverse of the range in 45 day stages with 53 easier or harder alternatives and variations and numerous mountain ascents”. So Georges, who has done much to promote the HRP, does not consider it to be a ‘purist’ route. We found his 1991 guide to be much more useful than Ton Joosten’s 2004 Cicerone Guide that was littered with errors and described a slightly different route. As you assert, there are numerous other parts worthy of exploration – for the central sections of the Pyrenees, Kev Reynolds’ books are inspirational, but just looking at the maps produces a plethora of mouth-watering expeditions. Hmm, you’re reminding me that it’s time that I went back! I have a copy of the Veron Guide and have found it the best. Mine is in French and although I have heard rumours of an English version I have never found it. Do you have one? The Joosten book is a bit hit and miss. I think this was taken from a Dutch book and looks more modern than it is by way of the fine Cicerone layout. Over the last few years I’ve had a number of emails from people that have found his itineraries a bit much. Personally when he says “you could break the journey here” I find that is about right. You must have been one of the first people to have used this guide. Of the other guides I prefer Walks and Climbs in the Pyrenees by Kev Reynolds although he has removed the HRP section from the last edition, presumably to make way for the Joosten book. I’m going to deal with this in the FAQ — any observations you have would be welcome! have just spent 80 quid on maps, nice little detour for me, this, wanted to get to ordesa last time and means I won’t repeat myself too much. If anyone knows of an english translation of Veron, pls comment. The Joosten book is good but has its issues, as pointed out. It is worth a detour to Ordesa. Start from the Pont d’Espagne and you can make the upper Rio in a reasonable day. If there is a lot of snow around up high progress will be slower. Last time I was there I cracked on and on to Bujareulo which was really too long. I’d passed any number of great, grassy, sites higher up. I’d recommend Torla as a place to spend a day. It is worth the detour. Torla is reached by a footbridge over the river, the campsite is on your left as you reach the bridge (not always obvious from the path), This was a lovely site with great people. One advantage of Torla that you won’t find in guide books is that it allows you to circumnavigate the Ordesa which is definitely worth it. Take the bus up from Torla — behind new visitor centre — and enjoy a dramatic but shortish day. Catch bus back down to spend late afternoon in Torla which is a characterful village. Last time I was there the route over the Breche was snowbpound and so I walked back up to Bujureaulo and spent an easy evening there before taking the old trade route over to Gavarnie. A good climb this but a nice walk. For some reason the groups who climb up from the refugio don’t drop down to Gavarnie on the obvious route! Some were heading for a coach at the old ski station! Sometimes not killing yourself gives real results! Beyond Gavarnie you are committing yourself to the HRP for another big chunk of time. But a combination of this and the GR11 is quite a venture. But a detour to Ordesa is worth it! mmm, on reflection, I think ‘little’ detour may have been the wrong phrase! Nothing is little in that heat, that high up. Can vouch for Respomunso variante which is stunning, as is Grande Fache. Snow cover was fine for us to traverse without crampons in late july, but obviously that can differ year to year. Nice piece, Andy. With the Scottish government on a suicide mission to destroy their country’s wild places perhaps it make more sense to travel to Europe in future, where they care about their mountains. Perhaps only then, when Alex and Jim have sold off all their wild land for greed (under the comforting cover-all of energy self sufficiency) and they are the only ones left in Scotland on holiday, perhaps then they will have a re-think. Thanks for the article Andy. As you know, I’m hoping to walk the GR10 this summer (still humming and haring over stove choices/shelter – all part of the fun of planning). Speaking as a Pyrenees first timer, your article and the comments above have simply whetted my appetite and reinforced my resolve to give it a go. I might even resort to that dreaded word – “credit”! How far is the Ordessa gorge from the GR10? Is it feasable from the GR10? Or maybe I should save it for a future attempt at the GR11, an excuse to return. I saw it on the Wilderness Walks film featuring Nick Crane ten years ago, and that programme inspired me to try the GR10 – so it’s about time I just get out there and do it. Looking forward to the FAQs and further articles. Keep ’em coming! My Véron guide is the 1991 Gastons – West Col Publications ‘English edition and adaptation’. They did them in 1981 and then in 1991, but later editions of the guide have not as far as I’m aware been translated. Not much has changed, though. We met Dutch people who were even more upset by Joosten’s book, and by his attitude when they tried to contact him. Weird! It looks as if Jay needs to buy Pyrenees map no 4 – Bigorre. The route from Col d’Arratille to Torla is easy, but my old 1985 map has the path passing through the Map Legend (we relied on a Kev Reynolds guide) and the route from the Brèche to Goriz can sometimes be a bit tricky – I recall having to borrow a crampon from a Frenchman! Well worth it if you have time, though. The Veron guide differs significantly from Joosten at times. Last time I was in Torla the route over Goritz was ‘closed’ in that the refuges were turning people back. The old trade route into Gavarnie was still a fine walk though! The Bigorre map is fine. The crossing over the Col d’Arratille is straightforward although last time I was there I had to deal with major snow. Picking a route down took some time. Stay on the left bank as much as you can as you descend. Past Bujareulo the path follows shady routes and some minor roads that serve the isolated high settlements. Hi- does anyone know if Torla to Goritz to Breche is now ok to use? I’ll check the websites this evening Sam. YOu do always have the option of taking the old trade route from Gavarnie to Buejello — which I’ve had to do on more than one occasion! I know the area well and would agree with all of your comments. I love the Ara valley down to Bujaruelo which is always deserted but is absolutely beautiful. Usually I head south from Respomuso following the GR11 first to Baños de Panticosa and then onto Bujaruelo but the route you’ve described is great as well. 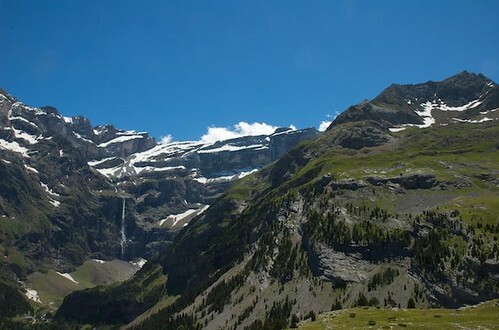 From Bujaruelo you can hitch a lift down to Ordesa and then follow the Faja de Pelay, spend a night at Refugio Goriz (perhaps two taking in Monte Perdido) and then cross through the Breche de Roland to Gavarnie – makes for a great couple of days. As you say – soo many options…. p.s. if you’re planning on staying at Goriz (with no tent) reserve places as it gets really busy. The Goriz facebook page is regularly updated with info on the conditions of the routes and if crampons are needed or not. Let me know which route you intend to take Paul! Hi Andy, this looks really cool on the map! We are hoping to spend 2 weeks hiking in the Pyrenees hut-to-hut next July (15-30, 2017). I’ve been looking at your trip on the map an trying to estimate times for each day to see if it’s something we can do. What I have worked out is the following – do these times seem reasonable? (We found on the Haute Route in Switzerland and the Alta Via in Italy that we were usually 20% slower than the given times.) (HRP is hours from the High Route Pyrenees book; other timings are from various web posts). The difficult day seems to be from either Oulettes or Bayssellence to R. Bajaruelo, since we aren’t planning on camping. A reasonable alternative seems to be to go from Bayssellence to Gavarnie, then over the Port de Boucharo to R. Bajaruelo. (alt. to do day 9 to R. Bayssellance (8 hr) then to R. Bajaruelo, but that seems to be 11 hr.